Best known for: Partnering with Joseph Eichler beginning in 1950 in a relationship that let Quincy dabble in his concepts for greenbelts and green design. His park-like common areas in tract housing developments were among the nation’s first. In 1966, Archibald Quincy Jones (who went by “Quincy”) completed a 32,000-square-foot midcentury modern residence for Walter and Leonore Annenberg on 200 acres in Rancho Mirage. The historic Sunnylands estate fulfilled their expectations for a Jones-style “statement roof” and a design that integrated the home into the landscape. Its exposed architecture that incorporates trellises, steel beams, and coffered ceilings receives thousands of admirers each year. Many know him for his multi-million-dollar, celebrity-style estates in Los Angeles. (Gary Cooper was a client; later owners include Jennifer Anniston.) But Jones had equal passion for elevating design standards for post-war, middle-income families. His tract home designs encouraged the fresh notion of indoor-outdoor living. In many, he introduced a usable atrium, high ceilings, and walls of glass within a modern post-and-beam framework. Regardless of status, anyone who has enjoyed a Quincy Jones roof overhead has him to thank for an open, expansive interior oriented to the outdoors (which colleagues said he designed from the inside out). During 42 years in practice, he completed more than 5,000 built projects. Jones got his start in 1937 working for Paul R. Williams, with whom he would later partner on several Palm Springs projects. After a three-year hiatus to serve in the Navy, he returned to L.A. and opened his own office. 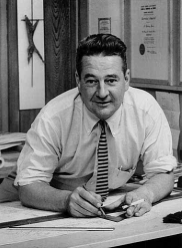 Open-minded and focused on building for “better living,” Jones made communal green spaces, varied home models, sustainable building methods, and non-grid site planning his trademarks. In 1947, Jones and Williams reimagined the Tennis Club in Palm Springs, redressing and reconfiguring it from its traditional Italian monastery style to a California modern club complex that harnessed the mountainside’s natural beauty. Two other desert projects followed for the pair. Jones was a professor and later dean the School of Architecture at the University of Southern California from 1951 to 1967. During his tenure, he designed university campus buildings and large office buildings.